In his 2018–19 Budget speech, the Treasurer said that ‘our $75 billion ten year rolling infrastructure plan will continue—strengthening our economy, busting congestion in our cities, making rural roads safer and getting our products to market’. Budget paper No 1 clarifies that this figure accounts for the period from 2018–19 until 2027–28. This announcement builds on statements made in the 2017–18 Budget in which the Treasurer stated the Government had increased total funding and financing to transportation infrastructure to $70 billion over the years 2013–14 to 2020–21 and projected the delivery of $75 billion in infrastructure funding and financing from 2017–18 to 2026–27. The Government states that of the $75 billion package in 2018-19, $24.5 billion is to be funded in 2018–19. This was clarified by ‘Treasury and Infrastructure department officials’ as being $4.2 billion on new projects and $17.8 billion to fund existing projects between 2018–19 and 2021–22. The actual amount of funding allocated to infrastructure has been subject to criticism. For example, the Opposition spokesperson for infrastructure said that, in 2018–19, ‘every project announced in the Budget will be funded from previous allocations, putting the lie to weeks of pre-budget hyperbole in which the Government pretended it planned to lift investment after years of cuts.’ Also, Infrastructure Partnerships Australia (IPA) said ‘Tonight’s Federal Budget sees infrastructure funding reduced by $2 billion over the forward estimates, meaning less cash for projects and more congestion for commuters’. Similar issues were raised in relation to the claims made in the 2017–18 Budget with the Opposition spokesperson questioning the total and claiming that spending was declining. This Brief outlines some of the funding mechanisms for infrastructure; in particular, payments to the states and the use of new funding mechanisms and challenges that hinder the reconciliation of the different claims on infrastructure spending. Traditionally, the primary mechanism for Commonwealth support for infrastructure—especially transport infrastructure—has been the outlay of grants to other sectors, primarily the states and territories. The Commonwealth makes grants to the states under the Intergovernmental Agreement on Federal Financial Relations, National Partnership Agreements, and Implementation Plans and Project Agreements. These payments are summarised annually in Budget Paper No. 3, Federal Financial Relations. The federal financial relations document also summarises untied local road payments to local governments. The Infrastructure Investment Program: covering Black Spot Projects, the Bridges Renewal Program, Developing Northern Australia—including Improving Cattle Supply Chains and Northern Australia Roads, the Heavy Vehicle Safety and Productivity Program, the Major Projects Business Case Fund, the National Rail Program—including a rail and road component, Roads of Strategic Importance, Roads to Recovery and the Urban Congestion Initiative. The Infrastructure Growth Package: covering the Asset Recycling Initiative, ‘new investments’, Interstate Road Transport and the Western Sydney Infrastructure Plan. A range of other infrastructure, including for example the Launceston City Deal–Tamar River, Murray-Darling Basin Regional Economic Diversification Program, Supporting Drought-Affected Communities Program, Western Sydney City Deal and WiFi and Mobile Coverage on Trains. Local road funding to local government is part of the total financial assistance grants made available to local governments. It is an untied grant, and is paid in addition to the infrastructure programs outlined. The Parliamentary Library has mapped the payments made for these types of infrastructure transfers from the 2013–14 Budget to the 2018–19 Budget. Over the period from 2014–15 to 2017–18 the payments total $29.5 billion, and over the period from 2018–19 to 2021–22 the expected payments total $24.3 billion, for a total of $53.8 billion. The pattern of payments in each of the federal financial relations budget documents, including the estimated final payment reported for each completed year, are summarised in Figure 1. It is apparent that the trend in nominal payments is downwards from 2016–17 until 2021–22. For example, the estimated outcome for 2017–18 is an annual payment of $7.9 billion, which declines to $5.4 billion for the 2021–22 financial year. This reduction appears to be what Infrastructure Partnerships Australia are referring to in their commentary noted above, and highlighted by the Opposition spokesperson in media commentary. There is no obvious explanation for the reduction in funding, with almost all components of the three program groups outlined above declining. Equity investments: akin to buying shares in a business, the use of which provides direct control over a project’s delivery and financing risks, and allows for potential future returns from profitable investments. For example, the 2017–18 Budget included an equity commitment of $8.4 billion in the Australian Rail Track Corporation Pty Ltd to deliver inland rail. Concessional loans: which provide a financing option to projects based on a lower interest rate or longer time frame than might be available in private markets. For example the 2017–18 Budget discussed a $2 billion concessional loan for the WestConnex project. Guarantees: where the Commonwealth accepts responsibility for defined risk events that would provide an incentive for private investors to invest. For example, the 2018–19 Budget outlines an indemnity given to the Moorebank Intermodal Company Limited (MIC) ‘...to cover all costs and liabilities that may be incurred by MIC in the event that the Commonwealth terminates the Equity Funding Agreement between the Commonwealth and MIC’. Creating funding pools: attributing a pool of resources that can be drawn upon for a range of related purposes. For example, the 2017–18 Budget outlined the $5 billion Northern Australia Infrastructure Facility. It is also feasible that some major projects could receive support by a combination of these mechanisms in hybrid form to manage more complex risks and financing requirements. The use of these mechanisms introduces comparability and counting challenges. It appears that the Treasurer’s $75 billion total in the 2018–19 Budget includes a combination of the payments to states and the gross value of commitments using these new mechanisms, as was the case in relation to the 2017–18 infrastructure spending claims. For example, in 2017–18 the then Minister for Infrastructure and Transport said, in response to criticisms, that ‘others focus on one component of the infrastructure spend, Payments to Support State Infrastructure Services. This is part of, but not the same thing as total infrastructure spending’. In his statement the Minster confirmed that the total included ‘financing and equity’. It is likely the same counting has occurred in 2018–19. Other spending included with the claim may relate to commitments which are not actually payments. For example, in 2018–19 the Government identifies ‘quantifiable contingent liabilities’. These include $4.2 billion of commitments, including a $3.0 billion commitment made to the Victorian East-West Link Project and a $1.2 billion commitment to the Perth Freight Link Project. The projects are conditional on the relevant states committing equal funding. Both of these projects were announced in the 2014-15 Infrastructure Growth Package and have been in each Budget since 2014-15, with the WA project getting an additional commitment in the 2015–16 Budget. However, there has been no actual expenditure. In Budget Paper 2, Part 2: Expense Measures identifies $116 million in infrastructure spending in 2018–19, with an additional $246 million over the forward estimates. In Budget Paper 3, Table 2.9 identifies $6.3 billion in infrastructure payments to the states in 2018–19, with an additional $15.1 billion over the forward estimates. A Budget press release from the Minister for Infrastructure and Transport identifies $5.0 billion in Commonwealth spending in 2018–19 on projects with a total Commonwealth contribution of $35.4 billion. This list excludes a number of programs, such as the Black Spot Projects, Bridges Renewal Program, and Roads to Recovery, as well as projects funded through equity (such as Snowy Hydro and Western Sydney Airport) and special funds (such as the Northern Australia Infrastructure Facility and the National Water Infrastructure Lending Facility). Projects which do not receive funding in 2018–19 are also excluded. A list of current major projects from the Department identifies $9.7 billion in Commonwealth spending from 2018–19 onwards, with a total contribution of $29.7 billion. A number of initiatives are excluded, including projects which do not receive funding in 2018–19. A 10 Year Infrastructure Investment Pipeline list from the Department identifies $24.6 billion of Commonwealth spending. It appears that this list includes funding provided in the 2018–19 Budget and is not completely additional to the list of major projects already underway. As funding detail is not provided, it is not possible to determine how these lists interact or the total amount of infrastructure investment. The Parliamentary Library has been unable to locate any public document which provides a transparent overview of total infrastructure commitments. This difficulty is not new. In the 2017–18 Federal Budget the Treasurer claimed $75 billion in infrastructure spending over 10 years. The Parliamentary Library was unable to corroborate this figure and the Department later identified $78.7 billion in infrastructure spending over 10 years in Senate Estimates. The Department may again provide new information about infrastructure spending commitments in Estimates hearings on the 2018-19 Budget. A summary of the different presentations of total infrastructure expenditure reported outside of the Budget documents is in Annex A. The 2018–19 Budget Papers reveal $24.3 billion in transfer payments to other governments for infrastructure. They exclude funding information for the years 2022–23 to 2026–27. While there is a range of projects discussed there is no information on the published record that outlines how the $75 billion commitment is measured. In 2016, Infrastructure Australia wrote ’infrastructure spending is dispersed according to often overlapping purposes of different funding pools... There is also a lack of transparency about how much is being spent and what it is being spent on. 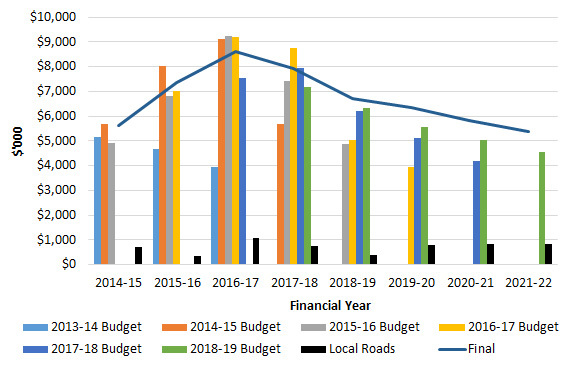 The community cannot access basic information regarding Australian Government spending on infrastructure.’ This appears to remain the case in 2018–19, with spending split between traditional payments to the states, various new financing mechanisms and the use of contingent commitments that do not attach to actual payments. *** Includes ‘major projects underway’, ‘new national initiatives’ and the funding amounts linked to the printed map. a. Department of Infrastructure, Regional Development and Cities, Strengthening Australia’s cities and regions: The Australian Government’s 10 Year Investment in Infrastructure, May 2018, p.4. b. Department of Infrastructure, Regional Development and Cities, Strengthening Australia’s cities and regions: The Australian Government’s 10 Year Investment in Infrastructure, May 2018, pp. 8–9. c. Department of Infrastructure, Regional Development and Cities, Strengthening Australia’s cities and regions: The Australian Government’s 10 Year Investment in Infrastructure, May 2018, p. 32.
d. M McCormack (Deputy Prime Minister and Minister for Infrastructure and Transport), 2018–19 Budget—Infrastructure: Busting Congestion, Connecting Our Regions, Improving Safety and Creating Jobs, media release, 8 May 2018.
e. Infographic in Australian Government, Budget 2018–19: Stronger growth to create more jobs, pp. 34–35. Australian Government, Budget speech 2018–19. Australian Government, Budget strategy and outlook: budget paper no.1: 2018–19, Statement 1, p. 1–18. Australian Government, Budget strategy and outlook: budget paper no.1: 2017–18, Statement 1, p. 1–1. P Karp, ‘Roads get $4.5bn in Australia budget but rail spending forced to wait’, The Guardian, 8 May 2018. A Albanese (Shadow Minister for Infrastructure, Transport, Cities and Regional Development), Infrastructure con job laid bare in budget fine print, media release, 9 May 2018. Infrastructure Partnerships Australia, Feds warm infrastructure narrative has not been met by cold hard cash, media release, May 2018. A Albanese (Shadow Minister for Infrastructure, Transport, Cities and Regional Development), Turnbull avoids truth about his big cuts to infrastructure investment, 10 May 2017. See, the Council on Federal Financial Relations, http://www.federalfinancialrelations.gov.au/. Some minor one-off payments such as ‘Supplementary funding to South Australia for local roads’ are excluded. This measure accounts for $40 million over 2017–18 and 2018–19. Assuming the estimated actual figure is representative of the actual expenditure in the year prior to a Budget year, based on Australian Government, Federal financial relations: budget paper no.3, for the years 2013–14 until 2018–19, typically Table 2.9. Australian Government, Federal financial relations: budget paper no.3: 2018–19, Table 2.9, p 45. Australian Government, Budget strategy and outlook: budget paper no.1: 2018–19, Statement 4, p. 4-13. Australian Government, Budget strategy and outlook: budget paper no.1: 2017–18, Statement 4, p. 4–9. Australian Government, Budget strategy and outlook: budget paper no.1: 2017–18, Statement 3, p. 3–13. Australian Government, Budget strategy and outlook: budget paper no.1: 2018–19, Statement 9, pp.9–15. P Fletcher (Minister for Urban Infrastructure) and D Chester (Minister for Infrastructure and Transport), 2017–18 Budget papers reveal record spending on infrastructure, media release, 11 May 2017. Australian Government, Budget strategy and outlook: budget paper no.1: 2018–19, Statement 9, pp.9–8 and 9–33 to 9–34. Australian Government, Budget strategy and outlook: budget paper no. 2: 2018–19, Part 2, pp. 136–149. Australian Government, Budget strategy and outlook: budget paper no. 3: 2018–19, Part 2, p. 45. M McCormack (Deputy Prime Minister and Minister for Infrastructure and Transport), 2018–19 Budget–Infrastructure: busting congestion, connecting our regions, improving safety and creating jobs, ministerial budget statement, 2018. Australian Government, Strengthening Australia’s cities and regions, p. 32. Australian Government, Strengthening Australia’s cities and regions, p. 4. S Morrison (Treasurer), Budget Speech 2017–18. Senate Rural and Regional Affairs and Transport Legislation Committee, Answers to Questions on Notice, Infrastructure and Regional Development Portfolio, Budget Estimates 2017–18, Question 26, accessed 16 May 2018. Infrastructure Australia, Australian Infrastructure Plan, 2016, p 23.